‘Fruit rather large and compressed; of a yellowish green colour, striped with red; flesh crisp, and high flavoured: ripens in October, and lasts till April. Yhis variety originated in Germany, and is considered the best dessert apple in that country.’ Listed among Autumn Fruit. [FCM p.41/1845]. Originated in the garden of the Duke of Augustenberg, at the Castle of Gravenstein in northern Germany, close to Denmark, about 1750. Fruit; above medium size, roundish, irregular, angular and ribbed. skin; smooth, clear, pale, waxen yellow, streaked and dotted with crimson, orangey next the sun. Flesh; white, crisp, very juicy, rich, vinous and powerful aromatic flavour. Produces a hardy and vigorous tree that usually bears well. ‘A very valuable apple of the first quality, and is equally desirable either for dessert or culinary purposes.’ Ripe in October and November. [HP. pl.XXXIX/1878]. 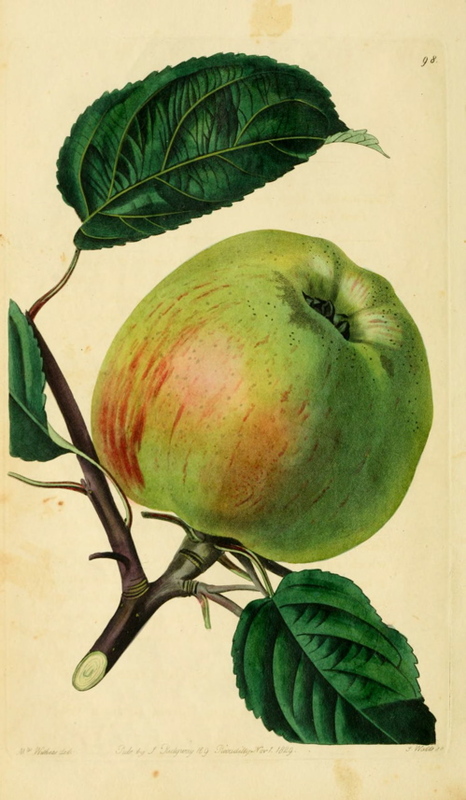 ‘Though not of recent introduction, this beautiful and excellent apple is comparatively but little known, otherwise it would be more generally cultivated. It is one of the favorite apples of Germany, particularly about Hamburgh, and in Holstein, where it is said to have originated in the garden of the Duke of Augustenberg, at the Castle of Grafenstein. The original tree is said to have been in existence about the middle of the last century. According to Diel some suppose it to be of Italian origin.’ [Hogg p.102/1851]. Listed in the 1850 and 1857 catalogues [Apple no.36/1850]. Called Gravestein in the catalogues.